Mt. 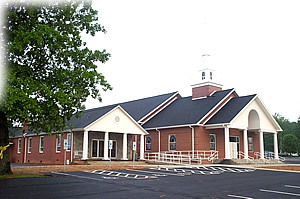 Nebo Baptist Church is a country church located on Old Mountain Road near Hiddenite, NC. Visitors are welcome to come join us as we worship our Lord and Saviour Jesus Christ. We invite you to join us for all of our services. Mt. Nebo Baptist Church has grown in number substantially within the last decade which prompted the need to construct three new buildings; one of which is our sanctuary which seats about 500 people. Visit our web site to see a slide show of the construction of our new Sanctuary. View Slideshow. Mt. Nebo Baptist Church folks love to sing! We currently have three choir groups and numerous duet, trio, and quartet groups. If you are saved and play an instrument, we have a youth orchestra which plays periodically and encourage those who once were in band to keep-on-playing for the Lord! For those who love and play "bluegrass", we (on occasion) have Christian bluegrass picking! Who said that being a Christian was a bore??? God's people have a REASON to celebrate! Visit our web site to see a slide show of our Choirs and Musicians. Visit our website to see a slide show of some of our past events. Mt. Nebo Baptist Church folks love to fellowship! We've enjoyed a multitude of activities including covered dish dinners, old fashioned day, pickin' & grinnin', skating, bowling and even white water rafting on the Natahala River! Special efforts are made to promote fellowship that spans all age groups. This includes BBQ's, field trips, skiing, camping, bowling and meeting with other churches for special services.